The idea of Nintendo selling miniaturised versions of its classic gaming hardware is still too good to be true. While there’s been plenty of discussion in recent times about how there should be better support for digital retro libraries on modern devices, clearly there is a huge demand for standalone legacy systems. According to the industry tracking firm The NPD Group, the NES Classic Mini was the top-selling console across North America in June 2018 in terms of unit sales. This is the first time the NES has led in the monthly unit sales since the charts originally began in 1995. This resurgence of the device impacted the wider market - with hardware sales across all platforms totaling $350 million. Compared to the previous June, this is a 52 percent increase in sales. When the NES Classic Mini was first released towards the end of 2016, Nintendo struggled to keep up with the demand. Nintendo of America boss Reggie Fils-Aime even admit at the time the company hadn't been expecting such level of interest in the product. The system was eventually discontinued in 2017 until it was recently re-introduced this year due to the sheer demand. Would you like to see more devices similar to the NES Classic Mini from Nintendo? Or would you prefer the company focuses on the future and adding proper retro support to the Switch? Tell us below. I love my NES Classic mini and my Super NES Classic mini they are phenomenal as well as fantastic conversation pieces when company stops over everyone asks about them . In stating that I am more than excited for the mini line to continue can't wait to get a mini 64 and a mini Gamecube even a mini Gameboy . Hands down Nintendo makes the coolest stuff . I don't have an interest in buying one, but how hard are they to find? Just curious. @ReaderRagfish There currently is a good supply of both at my local Walmart's shelf. I have throughly enjoyed my SNES Classic, although I have modded to run homebrew and additional games I own. I have played more Wall Jump Ninja (Atari 2600 homebrew) and Final Fantasy III than anything else recently. @ReaderRagfish They are very simple to find now. My local Target’s Nintendo case is completely full with Switch, NES, SNES, and more at the moment. It’s nice to see Nintendo finally nailing supply. I still haven’t found one yet in the store. To be fair, I haven’t been looking very hard though. @Agramonte Well it’s not like Mario Hoops or Strikers we’re system sellers, either. Anyone thinking Aces would move new hardware substantially is a little unsettled. @ReaderRagfish The Walmart and GameStop in my podunk rural farm town have plenty. @HobbitGamer I edit that out... it did drive sales, Just not enough. Game wise did really well. Shouldn't the tagline/subtitle be ''party like it's 1985''? @Liam_Doolan "Party like it's 1995" doesn't make any sense. People weren't buying NES's in 1995. The only relevance of the year 1995 is that it's when these charts started. The quote you took the year from was saying that the NES has never led in sales on their charts until now. I don't want a pile of plug and play consoles for retro games hooked up to my TV. I don't care about "conversation starters". I want those libraries of games on the Switch so I can play in handheld or on TV and take them with me where ever I go. I would pay the full retail price of the hardware, to buy just the digital collection on my Switch(though I would prefer it on a cartridge), and despite what some on this site might argue, I'd be willing to bet that it'd be a major seller. I am so confident that such collections would sell well, at that price point, that I'd bet an entire months pay that I am right. I want the NES collection, the SNES collection and a Game Boy, GBA, N64 and Gamecube collection. I'd buy them all day 1 even at the 80-100 dollar price points and I am confident that I am not alone. @avocadopear Haha, my bad - had to re-read that quote! Thanks for the heads-up. I think this is cool and interesting. This is not just nostalgia. It means that even younger gamers are also getting it. Just look at the most successful games ever. They don't have fancy graphics or production values. Mario sells more in 2D. BoTW sold more because it was more similar to the classic ones than OoT. Minecraft keeps selling. Real gaming is about the content not the graphics or gimmicks. June 2018 was the biggest month ever for Switch sales in the US when excluding the holiday months or its March 2017 launch. Mario Tennis Aces and Fortnite did a great job in driving hardware sales, especially after a slow performance in April and May 2018. All of this should lead to a great July with Octopath Traveler's launch. June 2018 was also the biggest month of sales ever for the NES Classic. Seems like Nintendo was able to properly increase their shipment figures to meet demand. No surprise really that a limited run $60 emulator outsold easy to find consoles at 5x the price. @Heavyarms55 What would sell better is locking those games behind the paid online subscription though which appears to be Nintendo's plan (at least regarding NES). I hate everything that’s not Nintendo now. @Andrew5678 Pretty sure your SNES Classic can also run NES Roms. @Crono1973 Yeah, but I like to support things I want when I can, plus I never played most of the NES games on the Classic before, so I'm fine grabbing it. And people wonder why the VC is going to stay dead. They're making a ton of money off bundles of old ROMs, and they don't have to worry about them crowding indies off the best-sellers chart. @Ralizah Tbh, this is what I appreciate most about these mini-consoles. Let the lesser known developers have their spotlight. Keep them happy, and they're more likely to hold your device in higher regard when they see how they benefit. I feel like their plan going forward is to build tight relationships with the best indie devs out there, and let them become Nintendo's 3rd party support for the future. My brother was able to get two of them in June. He gave one to me, so yay 😁. Currently playing Kirby and Star Tropics. @Agramonte I think Mario Tennis Aces probably exceeded Nintendo's expectations. Mario Tennis has never been a huge seller and this one probably will exceed 2 million. It's kinda surprising Nintendo hasn't released a huge system seller yet this year, relying on last year's top tier titles and an increasing library of mid-tier games to continue moving systems until the trio of Super Mario Party, Pokemon, and Smash. @Heavyarms55 I won't disagree. I think a LOT of people want there to be a Switch collection. People want everything NOW. Which means people who have purchased the switch are also likely to purchase a mini edition to be able to play it straight away. Eventually we can see which systems sold the most and which we could possibly add a larger calendar of games to if we release switch collections. Older gamers may not want to purchase a switch, but these consoles would be right up there alley. Each of these options are key to establishing popularity and sales. If they make a great return, switch VC can be enriched. So perhaps everyone who wants the Switch VC to come out sooner rather than later should think of it like this: these mini's are a great prototype for something greater. @diwdiws but one is king. it has always been. I just love how some people praise Nintendo for not having a VC on the Switch. These people care nothing about what consumers want and all they care about is how to make Nintendo richer. @Darknyht I don’t know how to mod but I DID score one off eBay with 6,000 classic games! Absolutely amazing! Mario Tennis Aces will surpass 2 million copies sold within the next 6 months. It's going to be a 3-4 million seller when all said and done. @roboshort yeah, not played it so can't comment on the game, but looks like a hit. Even more when you factor in it does not include digital. Well, also shows how much the Switch is a compelling product on its own. Both have a future in the video game space. Retro consoles not only triggers nostalgia for older gamers but also the nerd in all of us who likes to play with gadgets. While Virtual Console on Switch is great for those times when you get that Retro itch or to tide over a lull between big releases. Look at the contribution of those Snk arcade classics in the early days of the Switch. NES and SNES classic are fantastic bits of kit, and when hacked they become the ultimate good time. The fact that the NES is the biggest selling console in 2018 makes me feel all warm inside. One thing I noticed is that Switch sell-through in the US and Japan during the April-June 2018 quarter actually exceeded Switch shipments in the US and Japan during the April-June 2018 quarter by a sizable margin. This suggests that Nintendo spent much of last quarter trying to clear out some unsold stock in preparation for the 2nd half of 2018, which partially explains why the Switch's hardware shipments last quarter were marginally down YoY rather than flat/marginally up YoY. @westman98 is Europe where Switch is lagging in hardware sales? Sure seems that way. For some reason I figured this would happen, especially after the huge demand when it first came out...that reminds me I still need to pick up a mini SNES. We don't get exact hardware sales figures or leaks for all of Europe. The Switch has sold well in Europe, but exact sell-through is unknown. I'd like to see the total sales figures for the NES and SNES mini systems. This is crazy, and not in the good way. This is just madness. I love my SNES mini. Probably wont get an NES though because even though my NES works, I dont really care for it. It was my first home console that was mine, but eh. SNES did everything better. Hope they make a 64 classic soon. Playing Perfect Dark without the frame rate drops in HD will be cool. I must admit the PS4 is a monster. It outsold the Switch again. So much for that Fortnite "controversy" stalling sales. Lol! Put 'em on a cartridge, and I'd be willing to buy those collections in the $40 to $60 range. @westman98 If it does, that would make it the best selling Mario Tennis game, no? For the first time in my life I actually saw 3 NES Minis on a shelf in Meijer. If there's even a slight chance of it being there when I'm paid I will literally break myself to get one. I just need a lone NES Classic Controller to complete my NES Mini. Difficult to find. @SimplyCinnamon53 Oh I see. I didn't really read the article, I just saw that subtitle and left a confused comment. 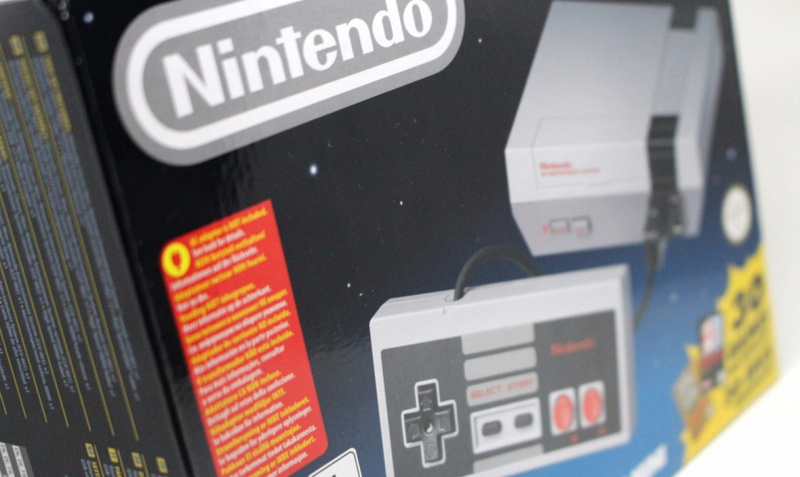 What's really impressive is that the NES Mini was only available from June 29. I think the real thing here is the NES mini appeals to nearly all older gamers or younger gamers with an interested in the old days. Regardless of if it's an old Nintendo gamer that still is a Nintendo fan, or if it's an old Nintendo gamer that long ago switched to Playstation, PC, or XBox, or a gamer that's never owned an Nintendo but has an interested in the early days when Nintendo dominated, the NES mini has appeal across the entire spectrum. Edit: OMG, I'm starting to speak in Reggie's speech patterns. Help! Heeeellpp! Mario Tennis Aces will soon become the best-selling Mario sports spin-off game when excluding the early Mario & Sonic games on Wii/DS. Makes sense. That and people probably wanted a shot at it, for fear of scalper sleazoids. Ninty is off my poo-poo list. There isn't much I haven't played on the Minis, but we've been having a blast. Just need to find controller #2. I wouldn't mind if they continued. I adore plug n plays. Though I'm not really fussed about getting a GC or N64. I'm sorry NEStalgia. Your doomed. @Elvie No problem, I do that too since I don’t always have time to read the whole thing. @westman98 this isn't a loaded question, but where do you get your numbers? I mean in NA, not Japan. Is it an estimate based on dollar sales? @westman98 I'll chalk it up to aliens.